As the Latin America and Caribbean region embarks on a new era of relations with the United States, the country of Guyana has provided inspiration for more inclusive governance and increased international cooperation. Much like the United States and other multi-ethnic societies, Guyana struggled for decades to reconcile the differences between its main ethnic groups. A historic election in May 2015 brought an end to nearly 50 years of political polarization, ushering in Guyana’s first multiethnic government, along with it the promise of a new approach to longstanding problems. History played a tragic role in the country’s troubles, but also laid the foundation for the hope of the current generation. Since gaining independence from the United Kingdom in 1966, Guyana’s government was ruled by political parties that divided its two main ethnic groups: the Afro-Guyanese, descendants of African slaves, and the Indo-Guyanese, descendants of Indian indentured laborers. Today, these groups make up about three quarters of Guyana’s population, and have struggled to form a cohesive political base. Many observers, including the current president, see the country’s stagnation reflected in this struggle. “The ethnic differentiation translated into political differentiation,” David Granger, Guyana’s newly-elected president, has said bluntly. “We don’t have to be poor, but we are poor because of the political conflict.” Guyana possesses tremendous natural resources: timber, bauxite, gold and a recent major offshore discovery that is estimated to contain billions of barrels of petroleum. This is in addition to the country’s stunning natural beauty that includes extensive tropical forests that cover more than 80% of the country. President Granger’s message of political inclusion and economic progress has resonated with Guyana’s population. “The time has come for racial and national unity,” he said as he campaigned in the early months of 2015. “The time has come to end winner-take-all politics, corruption, nepotism and the squandering of our resources.” The victory of Mr. Granger’s party, A Partnership for National Unity (APNU) and its coalition with the Alliance for Change (AFC) , represents a break from 50-years of fractious governance. Mr. Granger is the 8th president to be elected into office since Guyana gained independence, but his ascension to power represents just the second time the country has switched governing parties. It will also be the first time the country is ruled by a government that draws major support from both Afro-Guyanese and Indo-Guyanese voters. The coalition that brought Mr. Granger to power cuts across racial lines and has also drawn support from members of Guyana’s indigenous groups. It emerged on the political scene during the elections of 2011, when it started cutting into the popular support for the country’s two main political factions. Partly as a result of this election, Guyana remained at a virtual standstill until last year. 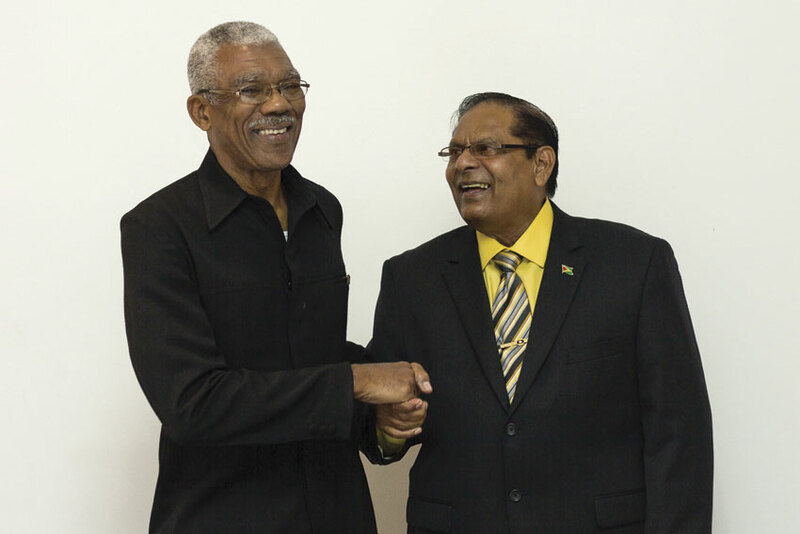 President Granger’s election victory last May ended 23-years of rule by the former ruling party, which was dominated by Indo-Guyanese and whose leader was seeking a sixth consecutive presidential term. A retired one-star general who is also a well-known historian, Mr. Granger has carefully crafted his inclusive political strategy and message to form this coalition, which includes prominent representatives from both of the country’s traditional political parties. Serving alongside him will be the newly appointed Prime Minister, Moses Nagamootoo, an Indo-Guyanese who defected from the ruling party (PPP/C) in 2011. Under the new government, Mr. Nagamootoo will enjoy expanded powers that include the chairing of cabinet meetings and appointment authority for the leaders of federal agencies. With the country celebrating its golden jubilee this year, the government is busy promoting events throughout 2016, especially focusing on engaging with Guyana’s huge diaspora. However, there are many more pressing matters the country must focus on too. Although Guyana has enjoyed ten consecutive years of economic growth, its economy remains heavily dependent upon the export of six commodities - sugar, gold, bauxite, shrimp, timber, and rice. Together these products generate nearly 60% of the country’s total economic output, and they are highly vulnerable to changing weather conditions and fluctuations in volatile global commodities markets. Guyana’s economy slowed in 2015, but still maintained a steady growth rate, reflecting the softening in global commodity prices including gold and bauxite, according to the World Bank, which also applauded “notable improvements” in Guyana’s services and manufacturing sectors. Thanks to last year’s political and economic progress, the International Monetary Fund (IMF) and World Bank are forecasting Guyana’s economy to bounce back strongly in 2016. In order to continue this diversification and modernization, Mr. Granger has adopted a outward-looking approach to economic policy. “My message will be Guyana is the best destination for investment in the Anglophone Caribbean,” he says. “We are the biggest, we are the most beautiful, and we are the most bountiful country in the Anglophone Caribbean.” As the only English-speaking country in South America, with a strategic geographic location bridging the Caribbean and the Americas, Guyana has a special role to play in the hemisphere’s economic development and political cooperation. Buoying the country’s prospects will be Guyana’s singular abundance of unspoiled wilderness and its outstanding record of conservation. Guyana has one of the lowest deforestation rates in the world. More than 90% of the country’s inland native forests remain intact, as more than 90% of the country’s 750,000 population lives along the northern coastline. Guyana’s forest lands are home to most of the country’s indigenous populations, who depend on their abundance for their sustenance. President Granger says the care Guyana has shown, and continues to show for its homeland through sustainability and conservation is perhaps the most pertinent message that the tiny country can send out to the rest of the world today, and something that all other countries could learn from.